If you're a sewing enthusiast who's admired the beauty and texture of sweater knit fabrics but didn't quite know how to work with them, then my upcoming video workshop is for you. In this course you'll learn the foundation techniques for working with this stretchy and sometimes challenging fabric. Garment industry methods are translated and reworked for your home sewing environment. Step by step you'll learn the ins and outs of working with sweater knits, while you complete a beautiful pullover sweater to wear and enjoy. Please join the workshop email list to be informed when registration for this online workshop begins again. My free bonus "Five Tips for Using Commercial Sewing Patterns with Sweater Knits" is also available. If you're looking for my index (of sorts) of blog posts on sweaters and tutorials I've posted, you're in the right place. Here they are! Steps for Sewing a Sweater -- Some of the steps were expanded upon or modified in the posts listed below. So glad I found this blog! I'm ready to cut n sew! Welcome, Kathryn! Sorry, I thought I'd replied a while ago. Perhaps it never posted or got deleted. :-/ I hope your cutting and sewing are going well! Feel free to ask if you ever have questions. I hope the blog's been helpful! Wow, great blog! Here I have created some wild fabric using the wrong punchcard for my 2-yarn lace which is falling out bc the stitches have no place to hold on. I was thinking of running a serger over them bc it looks so incredible.....I'd like to make a summer top from it. I got so excited finding all this sweater knit information in one spot. Thanks for consolidating all the great info you have on your blog in one place. Also, a big "Thank You" for sponsoring "The Sweater Knit Contest" on Pattern Review. The wealth of info on this blog was a key to my success in working with a delicate sweater knit I was afraid to use. I am reading all your tips in preparing for sewing the luscious pebbled denim sweater knit I just bought (at Joanns of all places! ), and am so happy I found your blog. And hey! When does all this great advice get put into a book? I just found your fabulous blog. I have been looking for info on sweater knits as I bought a bunch of St John Knits outfits at a garage sale. They are outdated looks but I thought, why not just cut them up for other garments. Finding your blog is a godsend, as I have too afraid to cut up the St John knits until I know what and how to do it. Any tips or blog posts you would suggest would be very much appreciated. Thank you. Welcome, Anne, and thanks for the kind words. Lucky you! I'm sure those St. John knits must have wonderful fabric. How fantastic that you get to give them new life. 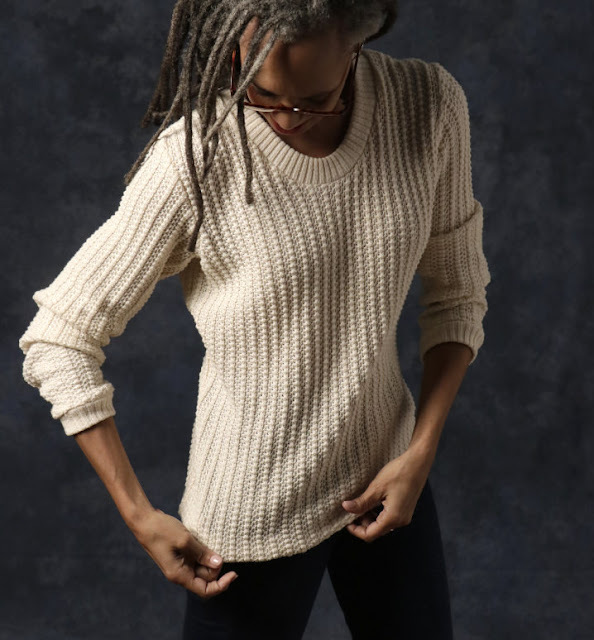 Here are Five Tips for Smooth Sewing of Sweater Knits that you may find helpful. If you're using a serger and the fabric is very stretchy, be sure to turn the differential feed up to at least 1.75. There's a search field at the top of the right column (desktop/laptop view). Feel free to search past posts on your particular topic and ask a question in the comments. Also please join the email list, if you haven't already. Tips and special downloads are often included with my newsletter.